Read The Rosie Project and The Rosie Effect by Graeme Simsion! 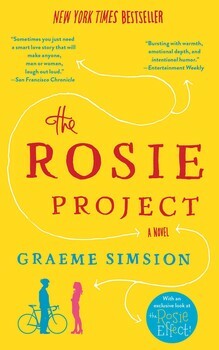 Description: Read The Rosie Project and The Rosie Effect by Graeme Simsion! This reading group guide for THE ROSIE EFFECT includes an introduction, discussion questions, ideas for enhancing your book club, and a Q&A with author GRAEME SIMSION. The suggested questions are intended to help your reading group find new and interesting angles and topics for your discussion. We hope that these ideas will enrich your conversation and increase your enjoyment of the book. In this highly anticipated sequel to the New York Times bestselling novel The Rosie Project, Don Tillman and his new wife, Rosie, find themselves with a new and unexpected “project”—a baby on the way. When he and Rosie moved to New York City, Don was willing to make a few adjustments to his rigidly structured lifestyle. But nothing could have prepared him for the arrival of Bud (baby under development). Soon Rosie is overwhelmed by Don’s overzealous research and retreats into her thesis studies. Luckily, Gene moves in to provide his trademark advice, but not all goes according to plan. As Don evades arrest, joins a research project on lesbian moms, battles an intrusive social worker, and attempts to invent a soundproof crib, he completely loses track of the most important project of all: Rosie. And when Rosie threatens to move back to Australia without him, Don must enlist all of his exceptional brain capacity to win her, and Bud, back for good. At the beginning of The Rosie Effect, we see that Don has made significant progress in allowing more flexibility in his life. What do you think is the most impressive change? Don notes that Rosie is able to compartmentalize her organization skills. She is completely in control of her thesis research materials, but can’t keep her bath towel in the same place. What do you compartmentalize in your life? How are you different at work versus home? Gene’s theories about relationships are heavily influenced by his job as the head of the psychology department in Australia. Do you agree that there is always an inequality of social capital in marriages? How does Don’s genetic research filter into his approach to love? Discuss the scene in which Rosie tells Don that she is pregnant. How does Rosie want Don to react? How do you think his sister’s fatal ectopic pregnancy affects his feelings about her pregnancy? Don has multiple mechanisms in place to maintain order. He meticulously plans meals and knows exactly how to deploy his Gregory Peck impression for optimal results. Do you have any similar systems or habits that you rely on to help your life stay organized? While tending bar, Don is offended when a patron compares him to Dustin Hoffman’s character, Raymond, in Rain Man. Discuss the differences between Don and Raymond, and the pros and cons of using the word “autistic” as an umbrella term. Discuss Don’s ability to sympathize versus his ability to empathize. He is able to excuse his former landlord’s unpleasantness by recognizing that his life is unrewarding. However, he finds it incredibly difficult to step into Phil’s shoes and imagine how he felt when Rosie’s mother died. Do you think this problem is exclusive to Don? Gene tells Don not to fetishize parenthood; that children are just like little adults who don’t yet know the rules. Do you agree with this advice? Discuss the rules that children must learn and the rules that they shouldn’t. As he and Rosie hurdle toward her due date, Don realizes that change is unstoppable. He thinks change is necessarily a bad thing. Do you think change can be good? Discuss examples of good changes. Discuss the symbolism of the eternity ring that belonged to Rosie’s mother. What does it mean to Phil, and now to Don? Do you think it’s significant that it is stuck on Rosie’s finger as she considers ending her marriage? Lydia ends up being a huge obstacle to Don as he tries to prepare for the baby. Discuss how her past experiences bias her against Don. Who else in the novel is unfairly biased? Is Don? After failing to reunite Gene and Claudia, and providing lovely advice to a bullied Eugenie, Don must accept that Gene’s lies went so far that he couldn’t turn back. At what point did Don’s lies become too deep? What about Rosie’s? What would you have done differently? Discuss the relationship between George and his son, who both abused drugs. How much can a parent blame themselves for their child’s shortcomings? At what point must that child be held responsible for their own actions? Has Rosie changed in this book? Some readers have suggested that Rosie is unreasonably intolerant of Don: “She knew what she was getting herself into.” Do you agree? Rosie tells Don that the things that she loves about him as a husband are precisely the things that will make him an incompetent father. Why do you think she changes her mind? Discuss Don’s comment in the New York Post: “Of course lesbian parents are not average. Hence we should not expect average outcomes. But it would seem un-American to seek averageness.” What is the distinction between averageness and tradition? How are Don and Rosie exceptional? Do you think Hudson will be exceptional? In honor of Don and Rosie’s little inside joke, host a Gregory Peck movie night and rent To Kill a Mockingbird and Roman Holiday. Try out your best Gregory Peck impressions on one another. Not everyone can be as adept in the kitchen as Don, but there’s no harm in trying. The first meal he cooks Rosie is “scallops with a mirepoix of carrots, celeriac, shallots, and bell peppers and a sesame oil dressing.” Here’s a recipe that comes close: http://frenchfood.about.com/od/maindishes/r/Seared-Scallops-In-Sage-Cream-Recipe.htm And don’t forget to pair with a nice pinot gris. 3. The Dead Kings isn’t a real band, but Café Wha? is a real place in Manhattan. Read up on its incredible music history and then plan a night to visit your local music club to support bands, new and old! How was writing the sequel different than writing The Rosie Project? Do you feel as though you’ve changed as an author? Two things made writing The Rosie Effect much easier (which is not to say easy!). First, I already had my central characters in place. Don’s voice and Rosie’s character were the two biggest challenges in writing The Rosie Project. Second, I was experienced. The Rosie Project was my first novel, and it’s always tough doing something for the first time, whether it’s making a complicated dish or overhauling an engine. The second time, you know what you’re doing. I’ve improved as an author and I’m more confident in what I’m doing, but I haven’t changed in any qualitative way. Yet. Did you feel any pressure returning to these characters, knowing that they had amassed such a loyal readership? What were you most worried about? Not for long. I wrote a couple of chapters to ensure I still had Don’s voice and was confident that my readers would stay with him as long as he remained true to himself. I was a little worried that readers who were looking for another romance/romantic comedy would not be so comfortable with a “honeymoon is over” domestic relationship. And I wanted to take those readers with me on the journey. You appear to be very familiar with New York City. What are your favorite things to do when you’re in town? Any favorite museums or restaurants? I’ve visited New York many times, going back to the 1980s, and lived there for six months in 2010. Like Don, I enjoy the Museum of Natural History. And we routinely visit the Met and MoMA. My wife and I are both keen diners, so we hit the restaurants and bars—and not just the upscale ones. We usually have a pizza at Arturo’s, try to get a table at Momofuku Ko, got to a few Mexican restaurants (Suenos in Chelsea is a good choice at happy hour), maybe a steak at Strip House, plus a few tapas bars—especially around West Nineteenth Street in the Flatiron district, where Don’s fictional bar is located (it’s a cross between Boqueria and Flatiron Lounge, with the addition of the incompetent manager). And we try to catch some stand-up: the Comedy Cellar is full of tourists, but still good. Don is not quite an unreliable narrator, but he misses social cues that the reader does not. Talk a little more about this narrative device. Do you ever find it limiting? On the contrary, it’s a very effective device for conveying Don’s character at the same time as telling the story. And it’s one of the key sources of comedy: the disconnect between what Don describes and what we think is really happening. I don’t feel a desire to take over as narrator and insert my own direct observations into the text. I know that for some readers, the fact that the story is told exclusively from Don’s point of view is disconcerting. I think the majority of relationship stories are told from a female point of view—this is certainly true of the chick lit genre. Someone accustomed to having the woman on the page at all times is going to miss Rosie! Don, Dave, George, and Gene form quite the boys club. Do you have a similarly close group of guy friends? I have a two or three such groups, but many of our social activities involve our (female) partners as well. There’s a bunch of guys from my previous profession (business/IT consulting) who get together regularly for a long lunch; and even though I don’t know these guys so well, a lot of important things get shared. Men (of my age and nationality at least) are often prepared to disclose more in an all-male setting. It’s a Wonderful Life figures prominently in the end of the novel. Can you identify with George Bailey? What would your world be like without you in it? Not really! I’m not nearly as saintly, and I’m sure there are a few people who think the world would be a better place without me. But in addition to my family role, I’m proud of having run a business that gave a start or otherwise played an important part in the careers and lives of many people who worked in it. Do you think Gene has grown or reformed at all since the first book? Do you see a future for him and his children? What about him and Lydia? We see Gene in a bit more depth in the second book. I think it’s more a case of understanding him better than any significant change. Many/most people have such a strong reaction to infidelity that it’s hard to see past it. I think he’s always wanted to help Don; he’s always wanted to be liked; and he’s wanted to play around. These aims have not always been compatible. I think he’ll stay in touch with his children, but geography and new relationships will get in the way of him being a close parent. If he’s able to make an impression as a professor in New York, I think he’ll stay. As for Lydia, it’s perhaps a bit soon—but I got together with my partner only a little while after a breakup and we’ve been together twenty-five years. It’s dangerous to make predictions about love. Dave has a lot of trouble standing his ground. Have you ever been in a tough situation that you felt was difficult to confront? Many, many times. I think my background as a consultant (and perhaps my life before that) inclines me to look for win-win solutions or compromises rather than putting too high a value on holding my position per se. You only have to spend an hour browsing Twitter to see the downside of standing your ground. I still try to confront the issue but not in a confrontational way! In which direction do you think Rosie will take her career? Talk about a time when you and your wife had to support each other in pursuit of a career goal. I think Rosie will end up as a researcher rather than a clinician. She’s not that much of a people person, and perhaps not a great listener! My wife and I have had lots of opportunities to support each other—in particular in our writing careers, which are second careers for both of us. When my wife won a big research grant to study postnatal depression, I’d just sold my business, and took over as primary carer for our kids. My wife was fantastic about me going back to college to study writing, and she is my sounding board for everything I write. And I do the same for her. Will there be another book about Rosie and Don? Can you give us any hints? Give me a few years. Let’s take another look at the family when Hudson is about seven, and see if he’s following in anyone’s footsteps. And what his parents think about that. And, remember, as the late Syd Field would say, without conflict you have no drama, and without drama you have no story. . . .